1. The Soil represents the fertile ground of Buddha's Mind. 3. 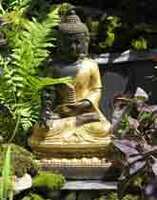 Dhamma is the expression of wisdom is the the Open Temple - The Garden. 1. Paths represent ways to enlightenment. 2. The soil represents the state of our Karma. 3. Planting represents fruitful and blossoming ideas. 4. The seasons represent fluctuations of the mind.